Neil Armstrong, a few days before his historic flight. True heroes are a rare commodity in the world these days and America has lost one of her greatest. Astronaut Neil Armstrong, the first human being to set foot on the moon, died today of complications following heart surgery. He was 82. He was the world’s hero, America’s hero, and my hero. I do not expect to see again in my lifetime an achievement equal to his. I am saddened beyond words by his passing. Well said PT. I couldn’t agree more! I know we think alike on this. I thought those numbers looked familiar. Nice to meet a neighbor. I agree, the story should have been Number One everywhere, on every news outlet, local and national. Enjoyed your salute. 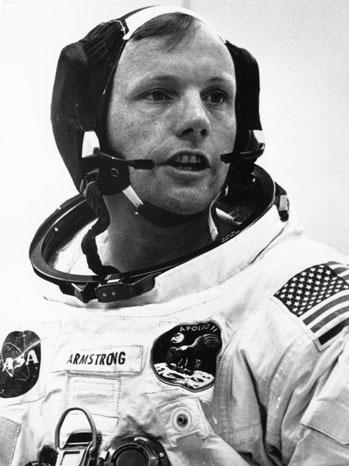 Armstrong was a true leader in one of the most important missions in our country’s history. Yes, we have lost a legitimate hero.